St. Nicholas Church at Ground Zero to be rebuilt- FINALLY! | the "silent" majority no more! ← Two NY Subways ads: Support Israel & Against Israel BUT…..
St. Nicholas Church at Ground Zero to be rebuilt- FINALLY! George Demos, the Conservative Republican candidate for US Congress in New York’s First District, who helped lead the effort to bring national attention to the plight of the 9/11 Church today praised Governor Cuomo for fulfilling Governor Pataki’s pledge to rebuild the only house of worship destroyed on September 11th. George Demos said, “Fifteen months ago when the ember of hope to rebuild St. Nicholas Greek Orthodox Church was nearly extinguished and our nation was embroiled in a controversy about the propriety of a Mosque at Ground Zero, we stood up and let the nation know that it was our obligation to rebuild the only house of worship destroyed on September 11th. Sadly the breakthrough only came after the Port Authority’s Director Christopher Ward, who had been maliciously blocking the rebuilding of the Church, was forced to resign. It took a decade, but a deal has finally been struck to rebuild a church destroyed on 9/11, the church and a public agency announced Friday. 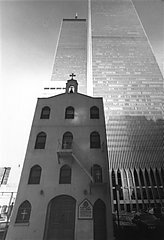 The Greek Orthodox Archdiocese of America and the Port Authority of New York and New Jersey said they have resolved their long dispute over how to rebuild St. Nicholas Greek Orthodox Church, a small, 85-year-old chapel that stood across the street from the World Trade Center and was destroyed when the towers fell. The church and the public agency had been at odds over the details of a land swap that will move the church slightly down the street to make way for some of the giant construction projects now under way at ground zero. The settlement, mediated by the office of Gov. Andrew Cuomo, will end a lawsuit filed by the archdiocese earlier this year. Under the deal, the Port Authority will pay for site-work and below-ground infrastructure. The cost of that work is estimated to be about $25 million, according to the governor’s office. The archdiocese will pay for the construction of the chapel. The new church will be about 3½ times as large as the old one, and also house a nondenominational bereavement center. “We will again light many candles in the new St. Nicholas Church and remember those who were lost to us, and those heroes who so nobly sacrificed their lives,” he said. This entry was posted in “NO!” to appeasement., current events, Fight for what is Right!, Look what happened America..., support our candidates!. Bookmark the permalink.